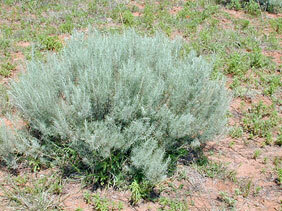 Also Called: Sand sage, silvery wormwood. Stems: Erect or ascending, much branched; covered with short, soft hairs when young; bark with longitudinal lines when mature; twigs erect, slender, flexible, branched, brown to grayish, pubescent to glabrous. Leaves: Alternate, simple, sessile, often clustered in bunches, 1.2 to 2.5 inches long, thread-like, grayish-green, short-woolly to nearly glabrous; lower leaves deeply 3-lobed; lobes very narrow, thread-like. Inflorescences: Panicle, leafy, plume-like, 6 to 8 inches long, 1/5 to 4/5 inch wide; heads numerous; bracts leaf-like, often exceeding heads. Fruits: Achene, egg-shaped, less than 1/25 inch long, brown, ribbed, 1-seeded. Habitat: Pastures and prairies; open, sandy soil. Toxicity: Horses that eat large amounts can develop "sage sickness". Symptoms include digestive disturbance, nervousness, and foreleg incoordination. Forage Value: No forage value for cattle; poor to fair for sheep and horses; fair for deer and antelope. A winter browse for sheep. Uses: Native Americans used an infusion of the plant to treat boils and indigestion. The liquid was also taken internally and used as a wash to treat snake bites. The soft leaves were used as a toilet paper substitute. Ground-foraging birds eat the seeds. Birds use sand sagebrush for cover and as a nesting site. Comments: Sand sagebrush is known to cause allergy symptoms. It bears fruit in October.